If you have ever spoken to someone about investing, maybe you have spoken to an advisor from your company’s 401(k) program, you have likely heard the term “asset allocation”. But what in the world does that mean? Asset allocation is dividing your investments across the three main asset classes (equity, fixed income, and cash) in a way that best reflects how much risk you are willing to take, how long before you will need withdraw your investments, and what your goals are. This post discusses what the three main asset classes are and the investor priorities when investing in each of them. As mentioned above, the three main asset classes, in order of riskiest to safest, are equities, fixed income, and cash & cash equivalents. Equity, also known as stocks or shares, is purchasing a very small piece of ownership in a business, and its value is determined by what the market (all investors) believe the total value of the business is. You make money in equity if a business grows or if the company chooses to pay dividends (distributing a portion of corporate profits to its shareholders). Equity is the highest returning main asset class in the long-term, but can be very volatile in the short to medium term as the U.S. or global economy grows or shrinks or a company faces problems that impact their profitability. The Great Recession in 2008-2009 taught many investors the true volatility that the stock market can see when the S&P 500 (an index of 500 of the largest stocks) fell 50.8% from May 2008 to March 2009. (1) Purchase broad based funds that distribute your investment over a wide range of stocks, instead of investing in single companies. This diversifies you so if one company gets into trouble, you don’t suddenly wake up to an investment value of half of what you put in. (2) Don’t purchase equities unless you are planning to hold that investment, i.e. not need the cash, for more than 3-5 years. This way if you put your money in right before the market declines, you have time for it to recover before you have to take money out. It also ensures any benefits you gain from your investments will be taxed at the lower long-term capital gains rate. (3) If you invest in equity funds, do not touch the money until you absolutely need it. The worst time to sell is when the market is going down as you lock in those losses and remove your ability to recover your investment when the market improves. Fixed income, also known as bonds and loans, is investing in the debt of a corporation. Similar to how you get a mortgage through a bank, companies can issue debt to the investor community to help fund new projects, acquire other businesses, or pay dividends. 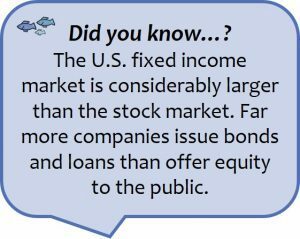 You make money on fixed income from the interest the companies pay on their debt, and ultimately your investment is returned to you when the loan or bond comes due (aka “matures”). This asset class is known as fixed income because of the fixed payment you receive, usually twice a year, for interest payments. The income from bonds and loans can help support you in retirement and offer a generally safer return on investment. If a company gets into trouble, they have to pay you back before the owners of the business can take any money for themselves. 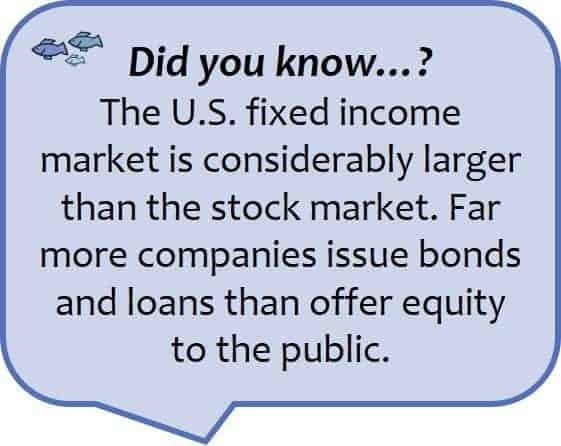 You won’t have access to purchase bonds or loans from individual companies, without incredibly high trading fees, because debt doesn’t trade on an exchange like stocks do. They are traded “over the counter”, OTC, meaning sellers and buyers need to be matched by brokers or traders. This means bonds trade less often and in much larger size, with a minimum trade for bonds usually a $200,000 block. Instead, you will be investing in bond funds that offer you ownership across a range of fixed income securities. (1) Bonds and loans have credit ratings, which are similar to how individuals have credit scores. Major ratings agencies Moody’s, Standard & Poor’s, and Fitch rate bonds and loans based on the likelihood a company will be able to pay them back. While there are a range of ratings, fixed income is broken into two main ratings categories “investment grade” and “high yield”. You want to make sure that the majority of your fixed income investment is investment grade debt. High yield, as the name clearly indicates, offers higher yields or interest rates, but they are also less likely to be paid back and much more volatile than investment grade debt. High yield debt is strongly correlated with equity so using high yield bonds and loans as your fixed income investment doesn’t really diversify your risk. (2) Interest from fixed income is taxable as ordinary income. If you aren’t using the interest stream as a source of income, you can set most bond funds to automatically reinvest the interest proceeds as it gets paid to avoid tax. (3) Investment grade fixed income funds, or funds that are heavily weighted towards safer bonds and loans, are a good investment choice if you plan to need your money in 2-5 years or if you want an investment that can generate a source of regular income. This is something we all know well so I won’t commit much time to it. 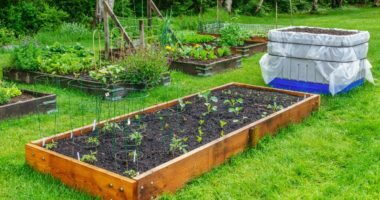 This asset class includes cash buried in your back yard, money in your checking and savings accounts, and U.S. Treasuries. U.S. Treasuries are included as they trade on an almost constant basis so you can redeem them for cash quickly, and it is considered to be (rightly or wrongly) guaranteed that you will get your money back. Treasury yields, the amount of interest paid on the investment, are much lower than corporate fixed income rates, reflecting the much lower risk. 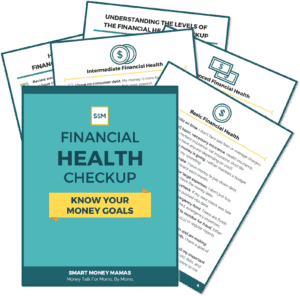 Cash is the safest of the asset classes, but you wouldn’t want to hold 100% cash as that ever-present bandit of inflation will slowly chip away at your worth over time instead of giving you the opportunity to improve your financial position. Keep 1-2 months of your emergency fund in cash, the rest of your emergency fund in a high interest savings account, and allocate the rest of your savings into equity and fixed income funds depending on your goals. As mentioned above, the three main asset classes, in order of riskiest to safest, are equities, bonds, and cash & cash equivalents. There are numerous other asset classes including real estate, currency, commodities, and various alternatives. These asset classes are typically higher risk and/or less liquid (longer amount of time until you can get your money back). In general, until you have built significant wealth, equities, debt, and cash will be sufficient to diversify your investment portfolio. Some people actively manage their asset allocation by buying and selling stocks and bonds to continually balance the portion of their portfolio that is in each asset class. Because stocks return more than bonds and cash over time, if these people don’t rebalance their portfolios on a regular basis they will end up with a higher weighting of equity than they intended. Similarly, because bonds and loans pay cash, if these investors aren’t in a debt fund that reinvests their interest their cash balance would build and throw off their allocation. Lucky for you, there are numerous low fee funds available from providers like Vanguard and Fidelity that automatically manage your asset allocation for different life goals. Target Date Retirement funds, for example, will allocate your money mostly to stocks when you are a long way from retirement, and slowly transition to a higher portion of income generating and less risky bonds and loans as you approach the time you expect to retire. You can either choose the fund that is targeted to your goals, or determine what allocation feels right to you and find a fund that matches your allocation target. 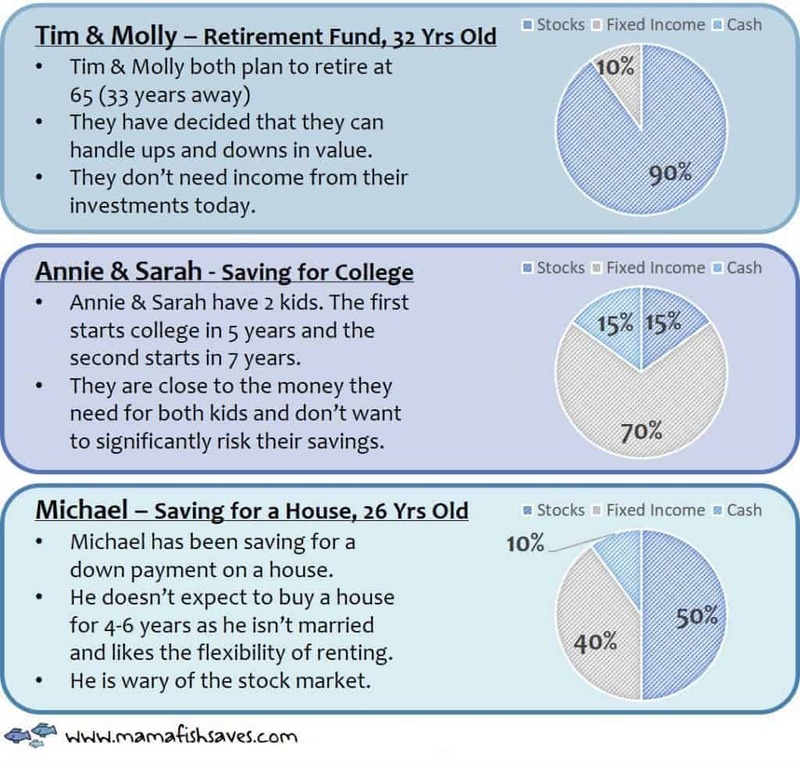 Below are some examples of asset allocation for a few individuals saving for different goals. You can see their different priorities and how that reflects on where their money money is invested. What financial terms do you want to see in our next definition download? Let me know and I’ll be sure to post about your term and how it impacts your financial health soon! 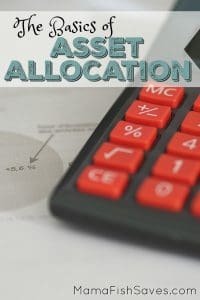 This is an excellent primer to asset allocation that does a great job of explaining the concept in layman’s terms. Anecdotally, it seems as if the general working population is entirely unaware of what they should be doing with their money to make it work for them longterm. Decades ago this seemed like a non-issue with so many jobs with pensions that took care of everything. Unfortunatley there looks to be a general distrust of institutional banks & wallstreet post 2008 so uninformed people with cash on hand are just sitting on it. Thanks for helping to spread the knowledge! A person who know how to explain something in a simpler way, is a person who understands that subject very well. Great post. Already shared on my social networks. Keep it up the great work.